Complete our survey by February 4, 2015 and you will be entered in a drawing to win one of two $100 cash prizes! 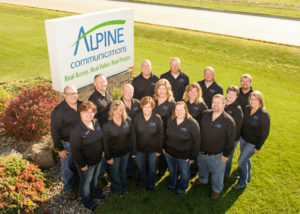 Alpine Communications has been serving West Union with wireless high-speed Internet since 2002 and is the local telecommunications, monitored security, television, and high-speed Internet provider to the Iowa communities of Elgin, Elkader, Guttenberg, Marquette, McGregor, Garnavillo, and Garber. Alpine Communications is conducting a survey of West Union businesses and residents to help evaluate the need for more advanced Internet, security, and telecommunications services in West Union. Residents and businesses are strongly encouraged to take a few minutes to complete this brief survey. Questions? Please contact Alpine Communications at 1-800-635-1059.